In junior high science class, I learned that baking soda was an alkaline powder. (Yes, I paid attention in junior high science.) Because baking soda is alkaline, when it’s mixed with acid, it neutralizes some or all of that acid, and in the process gives off carbon dioxide gas. My teacher demonstrated this memorably with a model volcano that bubbled up and erupted when he added vinegar to red food coloring and baking soda. When I got into the kitchen as an adult, I remembered that volcano, and so I understood how baking soda works—the carbon dioxide gas that’s given off enlarges bubbles that already exist in a batter or dough, which helps baked goods rise. But what about baking powder? Since it didn’t get covered in my science class, I had to do my own research (fun!). I’m sure I’m not the only cook who has wondered if baking powder and baking soda are interchangeable, and why some recipes call for one, the other, or both. The fact is, both are leaveners, meaning they help baked goods like cakes, biscuits, and pancakes rise. The difference is in how they’re activated. Baking soda (sodium bicarbonate, or NaHCO3 for all you geeks in training) needs an acid to enable it to give off the gas that enlarges a batter’s bubbles. 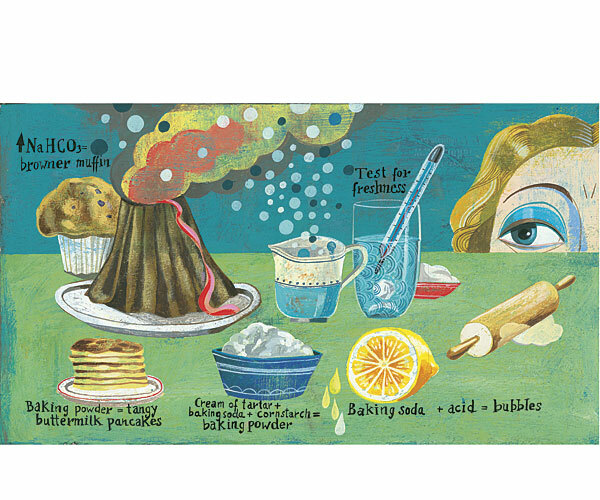 This acid could be lemon juice, buttermilk, yogurt, or vinegar (remember the volcano?). But more baking soda doesn’t necessarily equal more lift. You want to use only enough to react with the amount of acid in your batter. Too much soda and not enough acid to activate it all means that you’ll have unreacted soda left over, which will create a bitter or soapy flavor. Baking powder, on the other hand, is a complete package: it contains baking soda and enough acid to cause a balanced reaction. To activate it, all you need to do is add a liquid (which, by definition, a batter has to contain anyway). That’s why you’ll sometimes see baking powder with different labels. “Fast-acting” reacts at room temperature. In “slow-acting” baking powder, the acid doesn’t dissolve until it reaches a higher temperature, so it won’t start rising until it hits the oven. “Double-acting” plays it both ways—it does some reacting at room temperature and finishes up its reaction in the oven. Most of the baking powders you find in the supermarket are double-acting; the other types are used mainly by restaurants and commercial bakers. If you find a baking powder on the shelf and its label doesn’t specify a type (or your recipe calls for just baking powder) you can assume it’s the double-acting type. 1. You get to choose the ingredients that go into it (and can avoid acids that contain aluminum, which may result in a metallic taste). 2. It will be really fresh (because if the purchased kind is kept on the shelf too long, moisture from the air can cause the acid to mix with the baking soda, thereby neutralizing both). It’s simple to do. Mix two parts cream of tartar with one part baking soda and one part cornstarch. Store in a cool, dry place for up to several months. How long it lasts depends on how air-tight it’s stored, how often you open it, and the humidity. To test the freshness of your baking powder, either homemade or purchased, add 1 tsp. to 1 cup of hot water. The mixture should bubble. If it doesn’t, toss it. Generally, if you have a recipe that includes an acid (such as molasses added for flavor), you’d choose baking soda, which is activated by that acid. If you have a recipe that has no acid (say, eggs, milk, flour, and sugar), you’ll want baking powder as your leavening agent, because it has the acid built in. Also, double-acting baking powder has that delayed secondary rise when heat is applied. But it’s not always this cut and dried: Some recipes use both baking soda and powder. These recipes usually contain some acidic ingredient, such as fruit or yogurt, but the carbon dioxide created when the baking soda reacts with the acid isn’t enough to leaven the amount of batter in the recipe. That’s where baking powder steps in, to add the necessary extra lift. It’s all a matter of having the right balance in the recipe. Another reason to use both baking soda and powder is that they affect flavor and browning in different ways. Take this classic recipe for buttermilk pancakes. In it, buttermilk is used partly for its flavor. If you used baking soda alone, it could neutralize all of the buttermilk’s acid, and you’d lose that tanginess. But by including baking powder, which brings its own acid, some of the tang is left behind, and there’s still enough leavening for light-as-air pancakes. As for browning, too much acid will inhibit it—browning happens best in an alkaline environment. Baking soda not only reacts with the acid to create lift in the pancake recipe, it also creates an alkaline environment. And that means better browning. If you left out the baking soda and used only baking powder in the pancakes, they would rise, but wouldn’t brown as well. So a golden-brown and delicious pancake is one that has a more alkaline pH. With this tiny amount of chemical knowledge, you now have far greater control over your muffins, pancakes, and quick breads. Whether you want tangier, taller, or browner, using the proper leaveners in the proper ways will give you the baked treat you’re looking for. my pumpkin bread had pockets of white through out the bread. The recipe called for both baking powder and soda, and I had 5 loaves in the oven at 350 degrees. What happened here? Why does the majority Red Velvet recipes not include baking powder when they typically rise in the oven and then fall when it comes out? Wouldn't including baking powder help the rise and fluffiness of the cake?